Just after landing on the Ferry at Île Rousse, we head toward Casamaccioli, next to Albertacce, where Philippe Pierangeli and Jeff are expecting us. A “gîte” has been made available to us by the Corsican Tourism Agency. There we meet Jean-François Luciani, the house manager and mid mountain guide, who knows the surrounding mountains like his own pocket. 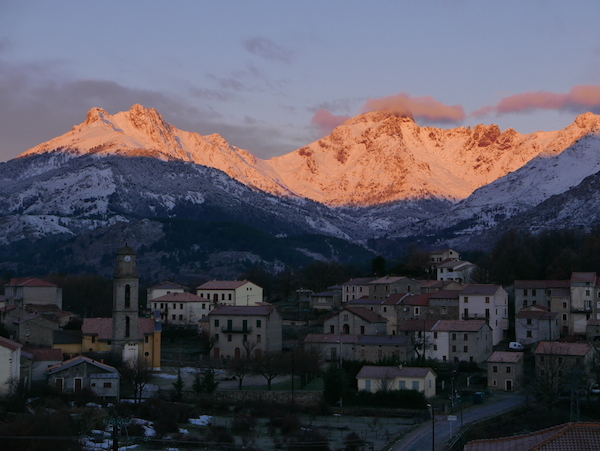 We discover the Paglia Orba, this beautiful mountain whose name refers to its slender shape leading to the stars, and decide to take advantage of the short weather window of the next day to have a look! 02/13/2015: Paglia Orba, first summit! First day of the journey. From now on, we will use no more motorized vehicles! So we start cycling in the cold morning to rally the small village of Calasima, about ten kilometers from Casamaccioli (pronounced “Casamacciol”). From there, we leave the bikes and we start the long approach from the east side of the Pagia Orba. It is not that much the length that slows us down, but the deep snow that we stir! We want to climb the Finch route, one of the first rock climbs of the island, whose first ascent, in 1909, was made by a pretender to Everest, which gave it a good try. This is a symbolic climb for us who are attacking our ” Alpin Everest”! In addition, there is not a more logical path than this one, which cleverly crosses the face from one side to the other in an aesthetic climb! Finch and his companions also located the ascent line thanks to the remaining snow deposited early in the season. Guided by instinct, a simple glimpse at the general route will be enough to climb that line. The difficulty is moderate, but it reserves some beautiful climbing sections! 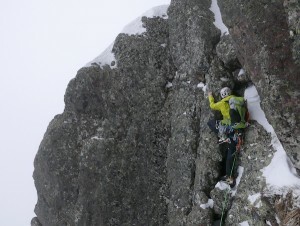 (At his time Fynch only had a hemp rope … ) the weather turning unfortunately bad, we do not see much from the top! We have the luck to immediately locate the right path of the descent and we reach the hut at dusk. 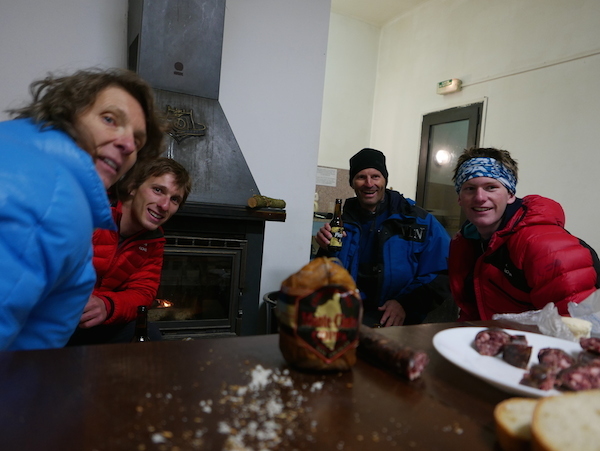 There, Pascal, Jeff, Philippe and Anne have carried up our skis and boots, saving us a lot of time on the way down! The long but beautiful approach to Paglia! It is a rest day! The whether is average, and we had planned to meet Jean-Yves, an organic chestnut flour producer, and Jean-François, a young shepherd who found his vocation at a young age. The first one explained us the problem of a Chinese parasite that is currently destroying the island chestnut production, then we are witnessing with the second guy the “fate” of a lamb, caused by an order of someone in the village … We finish the day around a good Pietra, listening to Corsican songs! A great “cultural” day , which allows us to better understand these mountain territories! As good competitors, we identify the route! We are lucky, this week-end is held the winter season “event” in the valley. This happens at the Vergio Col, 25km from Casamaccioli. We cannot miss it for any reason. However, as we have begun the crossing, our ethics requires us to rally the pass on bike! So here we are pedaling on Sunday morning to reach the gathering place. Many cars pass us, some folks encourage us when others offer us a lift! 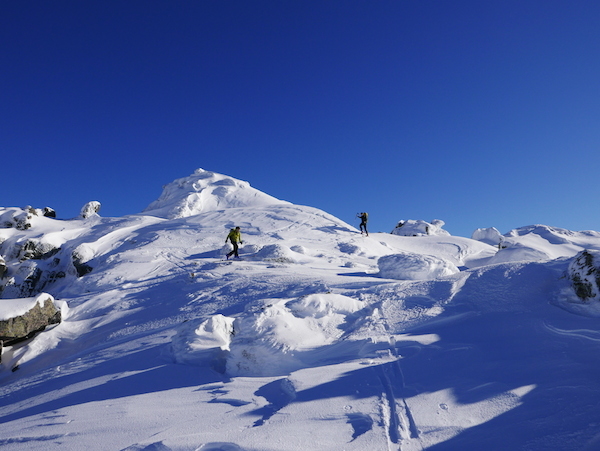 Up there, we decide to register for one of the two ski mountaineering races of the island the first one in 2015. 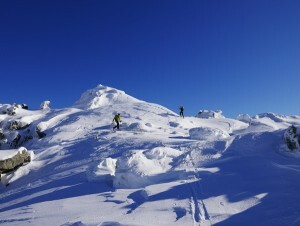 The ski touring is booming here, and a number of participants are new to the discipline! The route is a nice walk in the Corsican mountains and as an extra gift, we got half an inch of powder freshly snowed during the night! Despite some “pebbles surprise” we enjoy ! This is also an opportunity to meet and talk with locals who live in and by the mountain: guides, rescuers … they are all in Vergio this weekend! This morning, it’s not a dream weather: it’s pouring! At the same time, it does not leave us much time to climb the Cinto, our main objective, a symbolic point of our journey. As we do not have housing for, tonight, we decided to climb to the shelter for sleeping, as there is a possibility for the weather to improve on the next day. So we start cycling then skiing under this pouring rain. The time is not most pleasant, but it spices up the adventure, and he will undoubtedly leave us good memories. These unleashed mountain environments are always special and remain engraved for long! As we approach the hut, the wind picks up, and gusts cause us losing our balance! We reach our shelter at dusk! We must now cope with wet wood, but the stubbornness of Pascal and Yo ends up paying off, and we spend the evening with a good fire! The dish pasta with “trumpets of death” mushrooms is a real comfort! The wind raged the whole night and the shelter continuously trembled under the gusts. 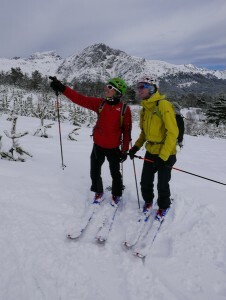 In the morning, after weighing pros and cons, we decided unanimously to waive give-up, given the high avalanche risk on some slopes. We do not want to take unnecessary risks on such a long project, even if it means missing out on the summit, which is important to us. We go down! 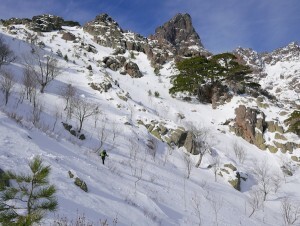 An epic ski descent before a wet downhill ride on bike … you really have to like it! 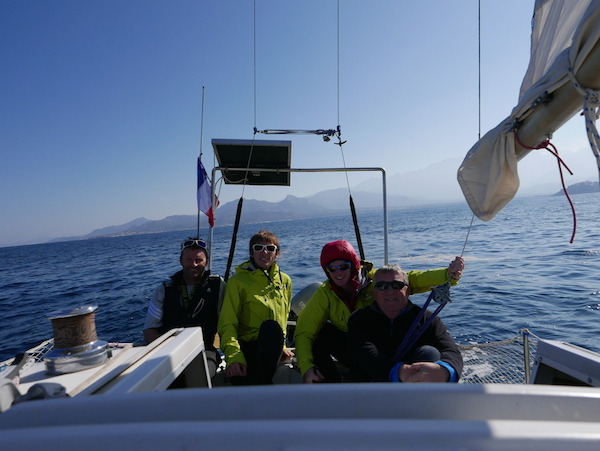 Arrived in Corte, on the advice of our guide friend Cedric Specia we decide to leave towards the Asco station to join the boat in Calvi by the mountains. And 4 hiking hours later, here we are, greeted by the headlights of Anne and Pascal for a good meal of local products! Corsican products to boost our energy level! 02/18/2015 : Monte Cinto ! The weather is sunny and the Cinto is just there, inviting. 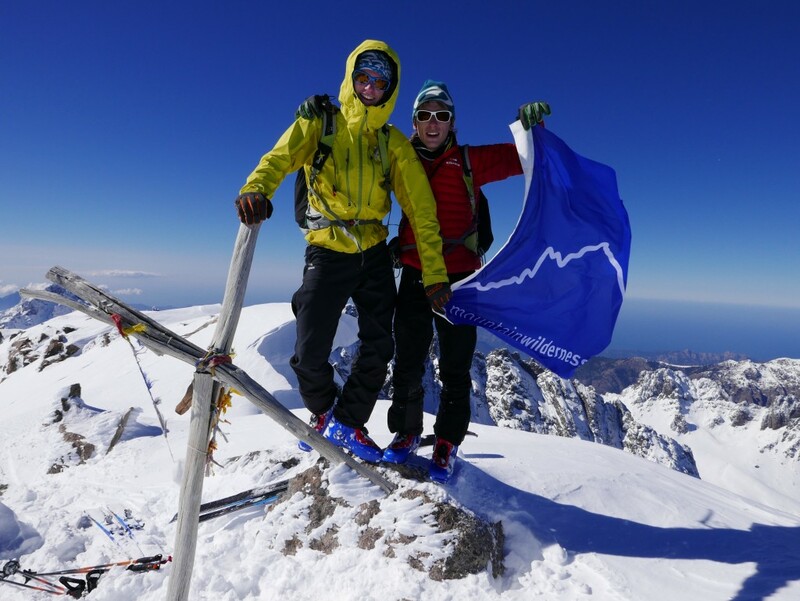 It was a phone call from our guide friend Didier Angeloz, which wanted to go skiing nearby the Cinto, that we decide to attempt the summit. 4 hours later, Pascal and two of us are at the top, with the sea in the background. Happy, we begin to climb the ridge leading to an express downhill slope on powder, then through a narrow canyon. But the day is far from over and we still need to go back to the top of the Muvrella by its long edge before tipping down to the sea. As usual, we arrived at night after a long day. Christian, the captain of Tirosa the sailboat, is waiting for us for the cocktail! 02/19/2015 : Bye bye Corsica!